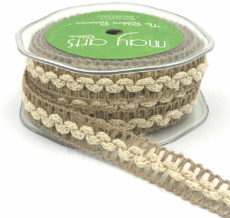 This 5/16 Inch alternating braided jute cord ribbon is great for adding a little fun to a gift wrap or craft project! 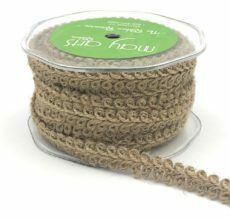 This braided burlap cord is available comes 10 yards to a roll. This cord is braided like a hair braid with an alternating ivory thread. It can work as a string or cord on stationery projects, be used in accessory products like headbands or necklaces, as well tied on gift bags. Mix this ribbon with our other cotton ribbons for a natural motif, or combine with silk for a bohemian vibe. This trim can be used like our other cords and strings for tying on tags, using on boutonnieres, and more. Perfect for every project and use from beach themes to weddings and more.